Along my journey I will share the "Lovely Lessons" that I've learned and my hope is that my fellow crafters, jewelry makers, and Etsy community will share their stories so that I may learn from them as well. Today's Lovely Lesson: Understanding Shipping and Handling Takes Time. When I first decided that I wanted to start P.S. 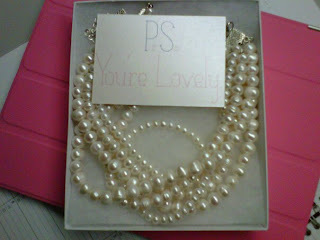 You're Lovely I thought that it would be as easy as making a wonderful necklace, someone will love it and buy it, and I'll drop it in the mail. PERFECT. I didn't even think about how I was going to package it, what that would cost, printing cost, shipping packaging, will I offer insurance, and the actual shipping. My head started spinning and I tried my best to figure it out on my own. I did ok but I quickly realized that I was not covering my cost and if I kept it up that I would soon end up eating my actual profits. To start, you need to know how much your method of packaging cost. I know I need the box to put the necklace in, the business cards I put inside to pass along to friends, and the bubble envelop to ship the box. Second, you need to understand your shipping options. Will you shipping First Class or Priority? Can you even ship First Class? I was trying to figure out how to handle my shipping and handling for multiple items and if it made more sense to package everything as one package and send them off individually. You can only ship First Class it what you're mailing is 13oz or less and once you go over 13oz your next option becomes Priority. If I have to mail off any combination of 2 necklaces that are multiple strands it automatically sends me to Priority based on the weight. For my current order of 3 necklaces the weight is 22oz. If I mail it Priority but I use my own packaging (bubble envelop, box, etc. ), my price will be $7.90. First Class is clearly the best option for me and I now see why so many in the Etsy community use this option. Any other option would mean I would have to charge more for shipping and handling and at the end of the day every cent matters. Needless to say, because of this Lovely Lesson, I quickly corrected my Shipping and Handling to protect everyone's pockets and ensure that each product from P.S. You're Lovely arrives safely to your hands. I put a lot of care into each piece I make and always want to ensure the presentation and quality of each piece make you want to come back soon. Oh yeah, for those of you that I know personally and its easier for me to hand delivery it to you, I still have to cover the packaging that you receive so please be understanding that a fee will still apply. Thanks for sharing in my Lovely Lessons. If you have dealt with similar issues or have suggestions or stories PLEASE comment and lets get a conversation going. I'm always here to learn and I get better each day because of the support I get from you.